Ellicottville, N.Y. - With the successful conclusion of the 2013-14 winter season, Holiday Valley&apos;s President, Dennis Eshbaugh announced the reinvestment of $3.7 million in resort improvements. According to Eshbaugh, "One of the keys to Holiday Valley&apos;s success is that we consistently reinvest in our resort. We stay at the forefront of technology, but also keep our guests coming back because they know we work hard to make their time at Holiday Valley memorable and fun." Headlining the projects is the installation of 54 new HKD Impulse automated snowguns. The new guns will be installed on Snowledge, the Wall, Morning Star and Crystal. The existing 161 automated snowguns installed over the past several years have resulted in impressive manmade snow quality and quantity. The automation increases efficiency and energy savings while providing the best possible manmade snow. Automated guns are adjustable for air temperature and humidity. As the air temperature and humidity drop, the amount of compressed air can be decreased, which saves energy. Holiday Valley will also be purchasing a turbo fan gun, a large "cannon" style gun for the Tubing Park. New snowmaking pipelines will be installed on 5 slopes: Reindeer, Woodpecker, Firecracker, Cindy&apos;s and Champagne. Holiday Valley now has a total of 595 snowguns including the new automated guns. Several slopes will be widened and improved. New connecting trails will be cut from the top of Morning Star to Crystal and the top of Sunrise to Bear Cub, and a new easier trail will be cut from the top of Sunrise to Cindy&apos;s giving beginners access from the Inn to the base area and the Snowsports School meeting place. The Eagle slope will be widened and equipped with HKD tower snowguns on its west side. The planning of the realignment of the Holiday Valley Road is underway; however this project may not take place until 2015. The goal is to improve access to the resort, traffic and pedestrian circulation and safety. A new clocktower and bridge will be constructed outside the Holiday Valley Lodge base area. The clocktower will serve as a meeting place and information station. The design will be similar to the clocktower that was razed during the Lodge construction in 2012, and it will be incorporated into the abutment wall of the bridge. Renovations of guest rooms and the lobby at the Inn at Holiday Valley continue with new furniture, carpets, wall treatments and countertops. Improvements to the Holiday Valley website and mobile website will be made and two new webcams will be installed. The warming hut at the top of Cindy&apos;s Run will be refurbished. McCarty Café will receive new window treatments and historical decorations in the fall. Non-winter season improvements are also underway. A new black diamond course at Sky High Adventure Park has already been completed and will open along with the rest of the Aerial Park starting May 2. A new hiking trail that begins at the top of the Spruce Lake chair and ends at Sky High will be cut during the summer and will be ready for hikers during the fall chairlift ride season starting in August. A shelter is also being constructed near Spruce Lake. The resort purchased 20 mountain bikes and cruisers that are available for rent at the Inn at Holiday Valley and the Tamarack Club. Plans have been made to build a mountain bike "flow trail" from Spruce Lake to the Mountain Sports Center, however the construction schedule is dependent on the successful bid by Western New York Mountain Biking Association to receive a grant from Bell Helmets. The deck around the Holiday Valley pools and Cabana Bar has been improved with additional space for outdoor games including "golf shuffleboard", corn hole and ping pong. The Cabana Bar canopy will be replaced this fall with a timber frame roof that will make the area useable in all four seasons. The bunkers on the back nine of the Double Black Diamond Golf Course will be rebuilt in the fall. Several additional projects are underway. Over the last 20 years, the resort has reinvested over $114 million, helping to make Holiday Valley a leader in year ‘round recreation in the Eastern United States. Holiday Valley is Western New York&apos;s largest year ‘round resort featuring 58 slopes and trails, 13 lifts, 3 base lodges, slope side lodging and dining, conference facilities, an 18 hole golf course, a tree top aerial adventure park, climbing forest and a mountain coaster. Holiday Valley is New York State&apos;s most visited ski resort. It is located on Route 219, 50 miles south of Buffalo, NY. 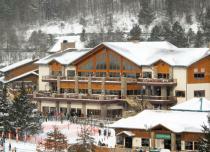 Visit www.holidayvalley.com or call 716-699-2345 to learn more.